Here is a look at the new Sacramento Airport. 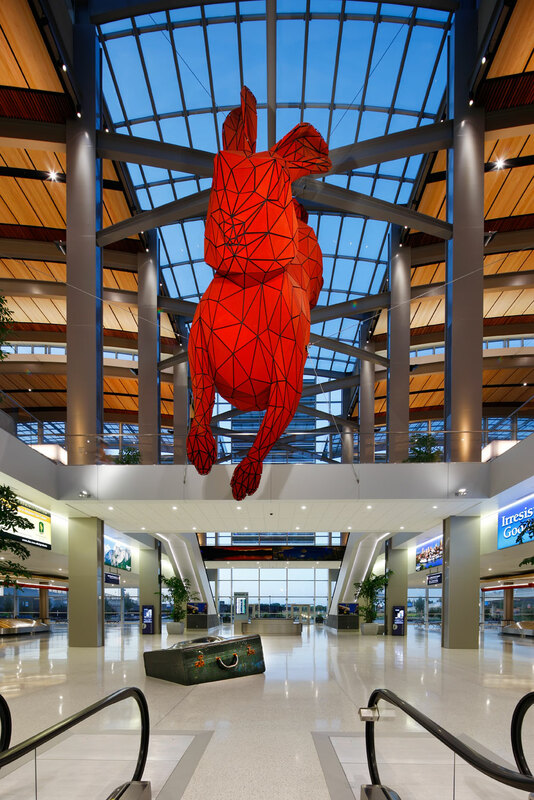 This was a commissioned assignment for the Artist who did the “Red Rabbit” Lawrence Argent out of Denver Colorado. Nothing like clouds help frame a building, sometimes it’s just luck or being there at the right time. The space works very well with daylight or at dusk, two different feeling with light in the same space. Wow, jumping thru the floor, lots of people talking about the rabbit. Great overall view, the contrast from the f blue light, let’s the viewers eye go to the red rabbit. Shot before the facility opened to the public, this would be hard to duplicate, after it is opens to the public. A little closer look for a detail, great space. Sacramento should be proud that we have a modern airport, maybe the new arena might be next. What’s better shot in the daytime or pre sunrise? Shot at pre sunrise the blue lights adds the pop to the red rabbit. The facility is open to the public, and people give the red rabbit scale in the space. Love this shot, the person on the right taking a picture of the red rabbit, just gives the meaning to art in public spaces. The piece of luggage on the floor weights 14,000 pounds, and the person moving in the corner adds interest to the final composition. You have to be able to show the suitcase, it has a special footing to support the piece of art. Abstract views are always those hidden shots that people do not see. First light, a nice glow of light on the steel. If, I was the artist, this view would capture the red rabbit in it’s glory jumping thru the floor, exactly how a rabbit might be jumping in real life. I sure like my job, hope you enjoy seeing Lawrence’s Red Rabbit.